The astrogeographical position of Delhi and New Delhi falls in the most centralistic signs of the zodiac: Taurus and Leo. This article explores the astrogeographical position of the Delhi area in regard to the continuity of its historical role as the central site of resonance for the union of the Indian States. Here is an overview of the chapters of Indian history I worked myself through so far. I`ll be working on this article in the future – so if you`re interested in the topic take a look into it after some time. Astrogeographical position of the government area in New Delhi for morphogenetic field level 1 which describes the supraregional and international resonance of the capital and central government of India: New Delhi has one coordinate on the highly magnetic, centralistic, royal degree of 26°Leo and the scond coordinate at 3°Taurus the sign of wealth, economym possession of territory and agriculture and an indicator for the importance of agriculture for India. These two signs are the most centralistic astrological resonators. This explains the particular quality of the region and city of Delhi as an area of centralism. The fact that the four superlarge countries India, China, Russia and the USA have their capitals in one of the two sign of centralism makes such a position seem highly supportive or even essential for central governments in the ncases of superlarge countries, mega-territories and mega-populations. 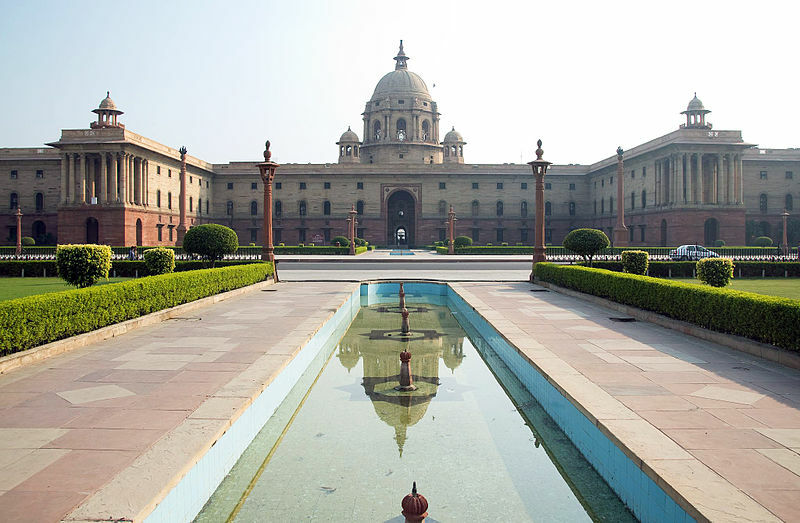 The harmonious resonance of the position of the central government of India with the resonating astrogeographical degrees of the capitals of the two military superpowers is an important aspect to be considered here. 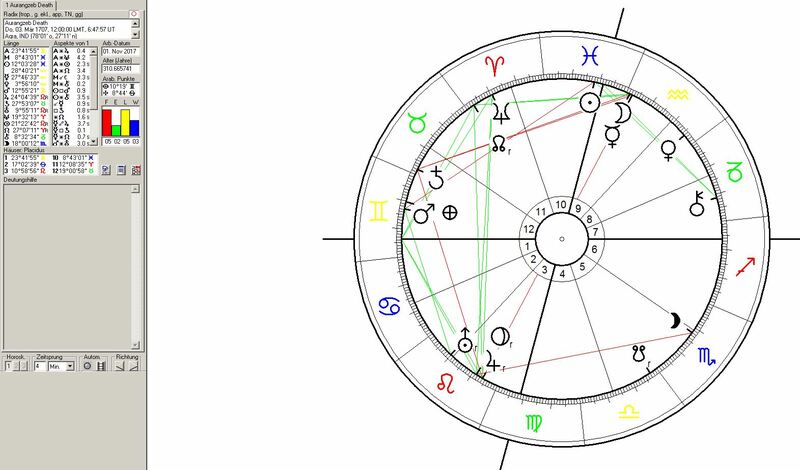 Washington at 27°Leo and Moscow at 3° Taurus are in the strongest possible resonance with the capital of the central government of India through conjunction. This is a clear indication that the world largest democracy though largely neglected by the USA in the past has an outstanding potential to serve as a link between the two superpowers. Compare my articles on the astrogeographic position of Moscow and of Washington. Whereas New Delhi has harmonious conjunctions with the US and Russian capitals – it has a strong tension through a square with Beijing`s 3°Leo coordinate. 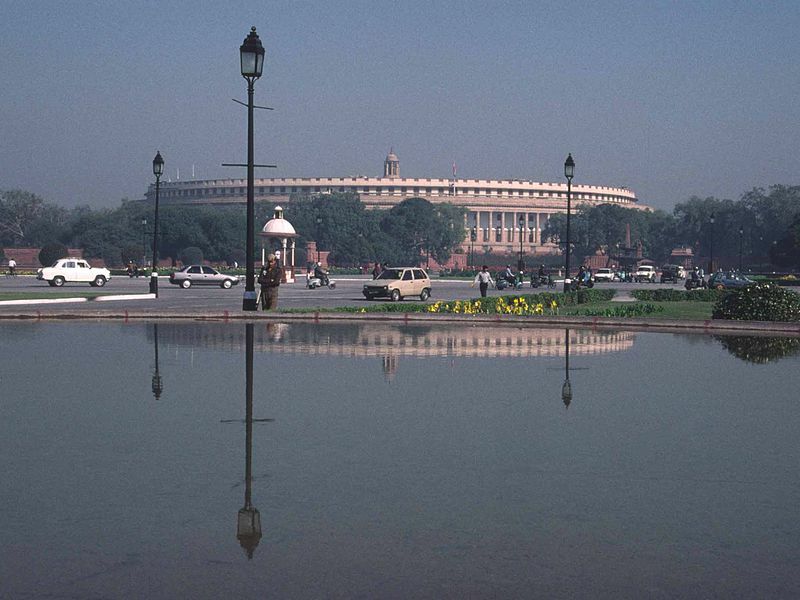 The Lok Sabha building in Delhi is located in the combination of the two water signs Cancer and Scorpio (field level 3 – surrounding area) the constellation which seems to be so archetypal for Shiva and Parvati, for the Shakti peetha and Jyotirlinga shrines and for Indian culture in general. This astrogeographical combination is also present at the Gaumukh source of River Ganges, the Devprayag Sangam, the birthplace of Mahavatar Babaji, the tallest Shiva statue and also India`s holiest city Varanasi located at 6°Scorpio and 21°Cancer. The coming transit of Uranus conjunct the astrogeographical position of Delhi at 3°Taurus the sign of mother earth, agriculture, economy, wealth, possession of territory will be effective between May 2018 and October 2020. The major challenges during this transit are in the fields of economy and ecology. Ecology because Indian cities are the most polluted on our planet – a clear hint at the corruption of politics, culture and mentality through the grip of hypercapitalism on the largest parts of India`s economy, social standards and political system. The transit of Uranus is an opportunity to emancipate the country from the grip of national and global economical players. 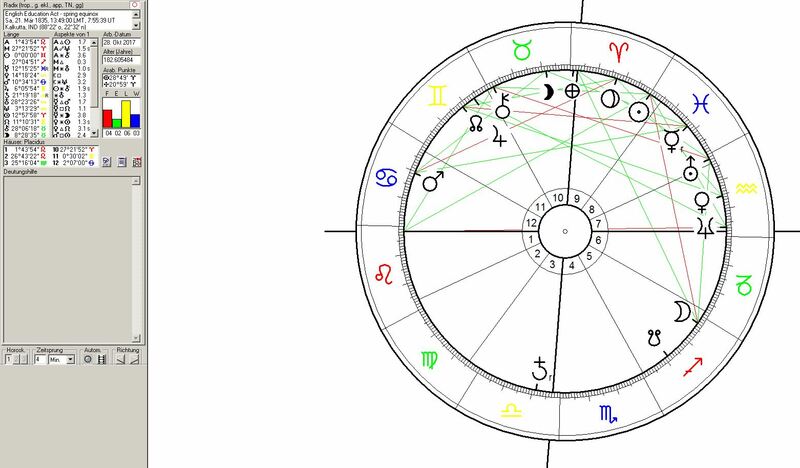 All the problems that remain unsolved during Uranus` transit conjunct the astrogeographical position of the central government in Delhi will result in even heavier challenges to the government during the phase of the coming Uranus transit over the square position to Delhi`s 26° Leo coordinate between May 2024 and May 2026. 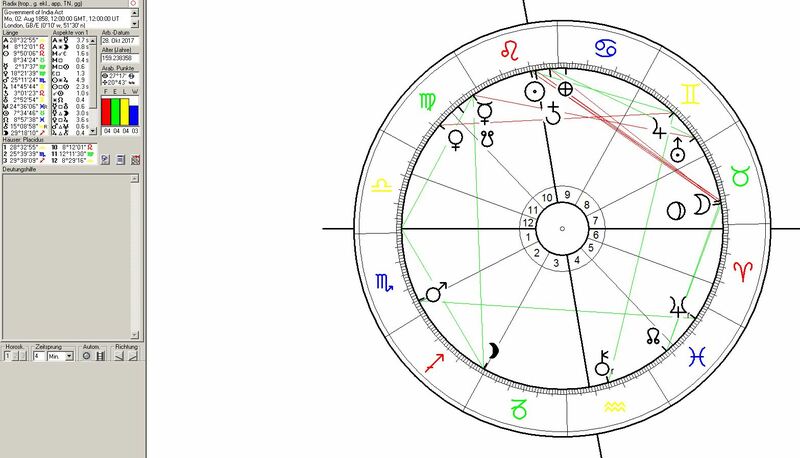 That Uranus transit puts heaviest and radical pressure on the position of the government through the influence from national and global economic players. The Pluto ingress in Aquarius in March 2023 will initialize the extreme potential of pressure on the Indian governement, See the examples of the similar Pluto transits during the assassination of Indira Gandhi in 1984 and the death blow to the Mughal Empire in 1857. The climax of this challenging and transformational period will not end before January 2028. This transit of Pluto the planet of self-defense, trauma, belief systems, ideology, role conduct and transformation of outlived patters in Aquarius the sign of self-finding, emancipation, innovation and self-liberation stands for a reality check of the political system, the centralism of the government, outdated structures and the caste system. The decision to shift the capital of British India from Kolkata ( 28°Virgo – 11°Capricorn) to Delhi was announced on 12 December 1911 by King George V at the Delhi Durbar. 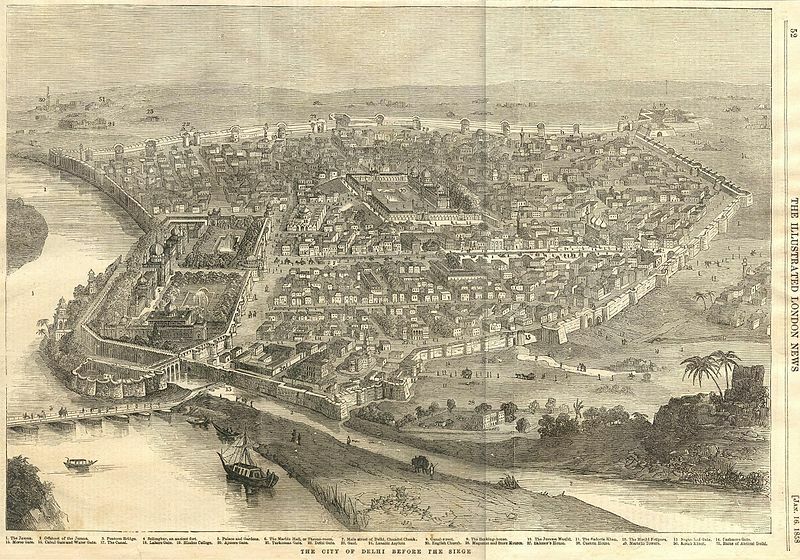 Delhi had served as the political and financial centre of several empires of ancient India and the Delhi Sultanate, most notably of the Mughal Empire from 1649 to 1857. The inauguration of the new capital in Delhi was celebrated on 13 February 1931. The shift from the old capital Kolkata to New Delhi saw the square transit of Uranus at 12°Aries to the astrogeographic position of Kolkata at 11°Capricorn. A classical effect of this Uranus transit was that the “social status” as the top ranked city in India was taken away from the City of Kolkata. The astrogeographic positions of the City of Delhi on the other hand weren`t enforced by any conjunction transit that would describe the new status as the capital of India as particularly auspiscious for Delhi. This could mean that the shift of the government to Delhi was rather a challenge and pressure than a support for the new capital. On the other hand these square transit challenges came from the fast moving personal planets (indication of practical problem) only and not from the slow moving outer planets (indication of structural problems). This indicates that the stimulus from these transits for new developments was on the practical, material and economical planes. Mercury from 2° Aquarius and retrograde Mars from 1° Leo moved in a square to Delhi`s 3°Taurus astrogeographic position bringing social and technological innovations modernization and topics of emancipation (Mercury) and military power, self-esteem and centralism (Mars in Leo) back to Delhi. The Sun at 23°Aquarius was approaching the opposition of Delhi`s royalty degree at 26°Leo questioning historical structures, Indian nationalism, cultural autonomy and inheritance and self-esteem. The astrogeographical transits for Delhi on the day of the factual independence of India saw a square position of the axis of the North and South nodes Rahu (28°Taurus) and Ketu (28°Scorpio) in exact square to the royal degrees of the position of Delhi at 26°Leo. The North Node at 28°Taurus a degree of wealth and highest profits in the sign of agriculture stood for the aims and success of the Green Revolution in indian agriculture and food production. The opposition of Chiron the planet of careful, self-protective strategical planning at 4°Scorpio to Delhi and in Scorpio the most important astrological resonators of Islamic religion stood for the need to accept the independence of Pakistan from Delhi as an unavoidable fact. The dominant conjunction of Saturn, Pluto and the Sun with Venus in the centre of Leo the sign of monarchy, aristocracy, hierarchy, sexuality and the topic of royal centralism stood for the dead remains of the hierarchical structres of the inheritance from the British, Mughal and Rajput empires in India, the caste system (Pl-Sa), slavery and prostitution (Ve-Sa), Burning of widows (Pl-Sa-Ve in Leo), group violation of women (Ve-Sa-Pl in Leo) and traditional dogmatic belief systems (Saturn-Pluto cj.) that blocked the light, life and the heart (Leo) of the vivid aspects of inheritance of indian culture and the potentials of self-expression and individualization of the people at the time. In that it stood for the end of something old and dying in the first place though through a birth or rebirth process (Leo). But in many ways the dominance of royalistic structures appear highly antagonistic to the foundation of the comparatively modern electional and parliamentary system of the Indian Republic founded 2 1/2 years later in 1950. The deadly conjunction of Pluto with Saturn that was overshadowing Venus the planetary indicator for territorial possessions stood for the ending and the transformation of control over territory. In regard to the ex-colonial power through loosing this superlarge country and ressources and for the Indian peninsula through loosing the territorial unity of the country implanted by the British. The position of Mars on the first degree of Cancer the sign of english culture and in house 2 the house of material roots and factual rulership over territory stood for the remaining strong ties with the UK and the fact that new born Indian democracy was built on structures installed by the British Empire. A few words on the topic of the astrogeographical resonance of the transits with other capitals: The Moon at 27°06` Cancer (a degree of separation and in the sign of traditional english culture) was in exact square and opposition to the astrogeographical coordinates of London at 24°Libra and 27°Capricorn. This aspect stood for the losses that the british government had to accept. In this sense the chart had its Moon position in the processes within the british homeland. The astrogeographical positions of Karachi the first capital of Pakistan at 3°Leo and 25°Aries were challenged through the square positions from the Moon at 27°Cancer and Chiron on 4°Scorpio. 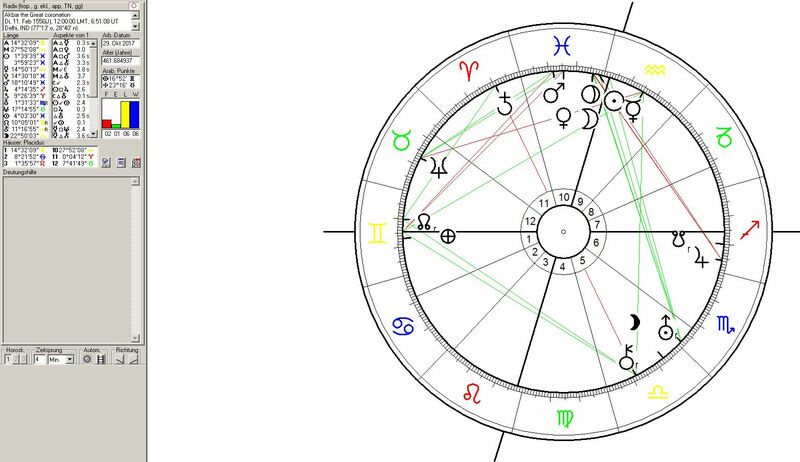 Apart from the midnight chart of 15 August which validated the factual independence of India there is a second important and extremely impressive chart I want to show here: the chart for the moment of the swearing in ceremony of the new government at 8:30. It can be interpreted as the chart for the independent political institutions of India. 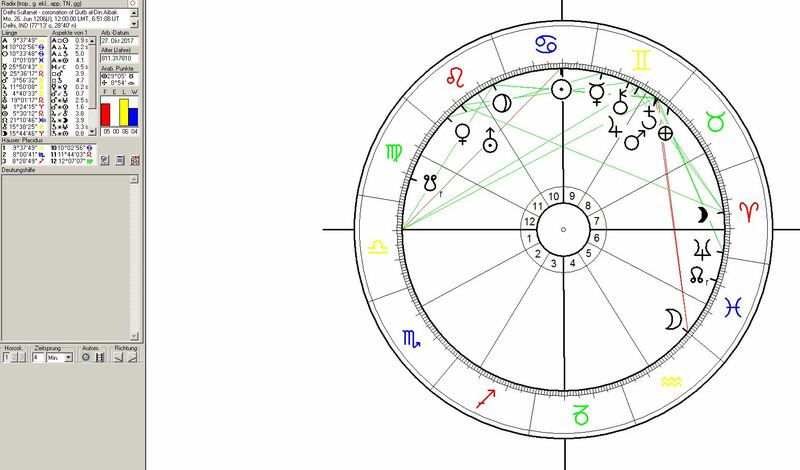 This chart had Uranus the planet of self-liberation, revolution, emancipation from slavery and reconnection with the fuller amount of the country`s potentials at midheaven in a constellation of revolution, political change, separation, divorce and leaving the past behind. Uranus was joined by Mars in a constellation of fundamental mutation which due to Mars` position on the first degree in Cancer also of radical emotionality, extreme aggression, revenge and violence. The first degrees of Cancer stand for the initial phase of emotional independence and the development of a defense system of individual emotionality. The most problematic aspect to be dealt with under this Mars-Uranus conjunction was the Indian Separation of Muslims and Hindus through the independence of the two territories of Pakistan from India. 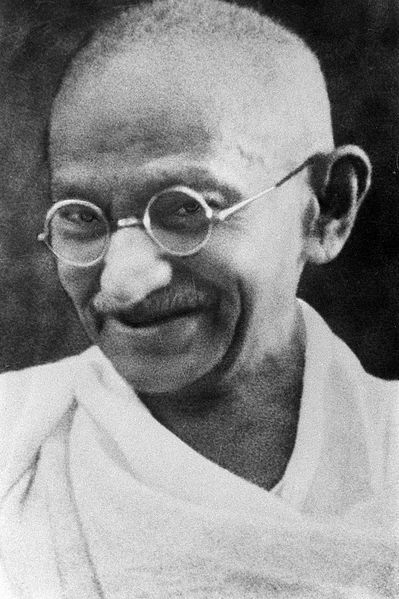 During the assassination of Mohandas Karamchand Gandhi through hindu fascists on 30 January 1948 Mercury the indicator for conspirations, lying, stealing, pubercy, the competion for intelligence, practical solutions and a tendency to leave spirituality behind was at 26°30` Aquarius the sign of uprisings and self-finding in exact opposition to the 26°Leo astrogeographical position of Delhi. This opposition of Mercury stood for a straight conspiracy against the central government. 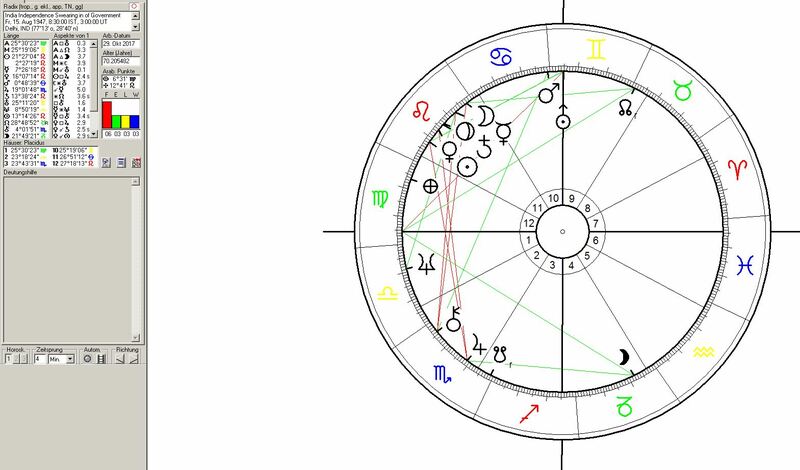 A second aspect of strongest tension to the 26°Leo position of the central government of India came from the square transit of Chiron at 23°28` in Scorpio a strong indicator for Islamic religion. As the indicator for strategical planning and action and protection of one`s rights Chiron stood for the issues and influence of the muslim minority and their aim of founding a muslim dominated state in India. In the foundation chart for the modern Republic of India the Moon on 5°Taurus the sign of agriculture was conjunct the 3°Taurus astrogeographical position of the central government in Delhi. This constellation together with the Venus-Jupiter cj. in Aquarius the sign of revolution stood for the Green Revolution in India. At the same time the Sun ruler of Pluto the planet of trauma, dogma. fascism, social hierarchy, castration and role conduct in Leo was in a square to Delhi from 5° Aquarius. 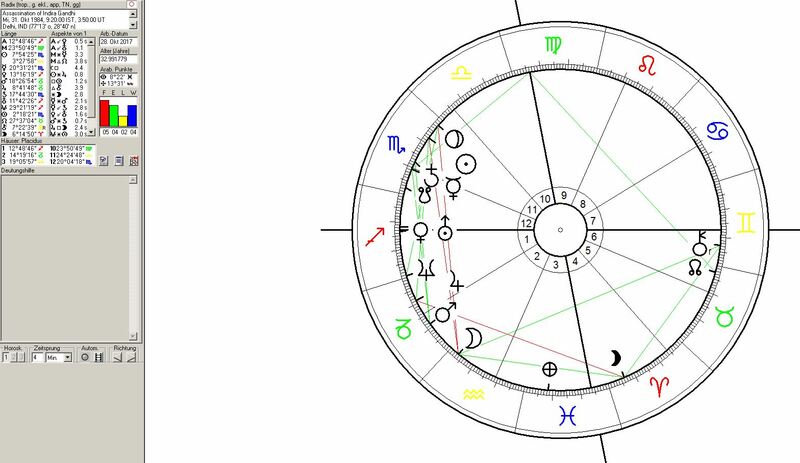 Astrological chart for the proclamation of the Republic of India on 26 Jan 1950 at 10:15 in Delhi. 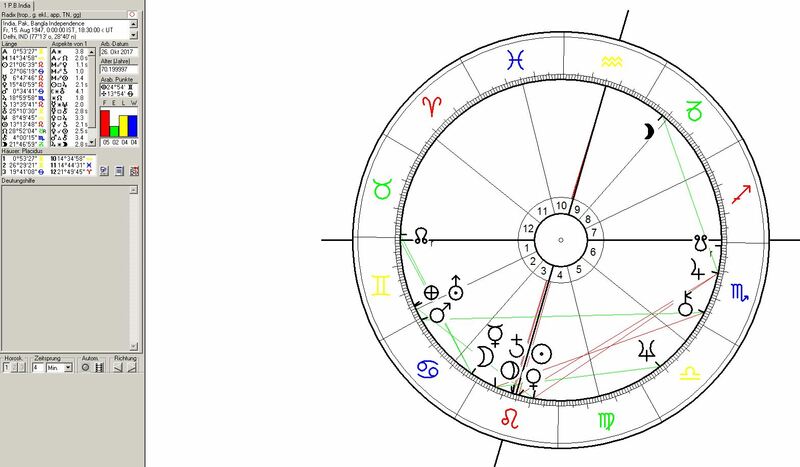 The chart for the proclamation of the Republic and constitution had an early Aries ascendant – pointing at a new start. Uranus the planet of spiritual, social, political self-finding and reconnection with the fuller potential of the country and people was in an important position on the IC (interior heaven) explaining the inner self-finding process of the peole, self-liberation, self-help and emancipation from slavery as the central issues. The inheritance of yoga-culture is included in the demand for self-cleaning of this constellation known for its intense relation to monkhood, celibacy and spiritual liberation. 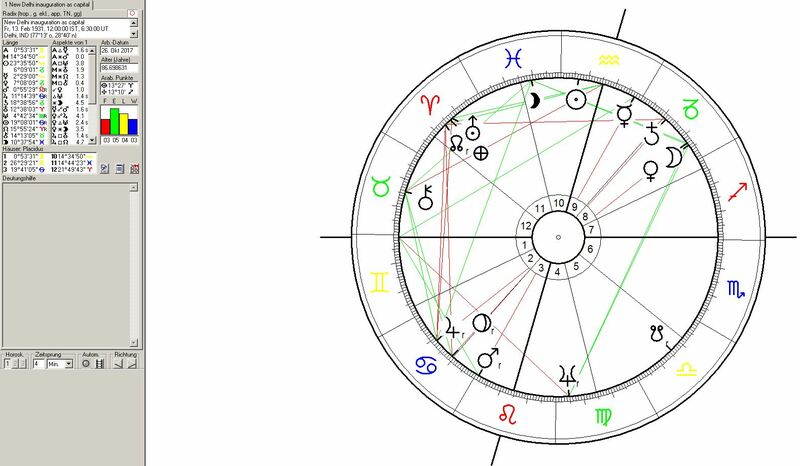 As Uranus represented the sign ruler of the Sun and the Venus-Jupiter conjunction in Aquarius his position shows the fundamental need for change within society in regard to the emancipation of the country from accumulated issues from the past such as: the globalized hypercapitalism of the British Empire, the caste system, slavery, the trauma of the Muslim minority reign over Hindus before the British Raj and many more. This Uranus position placed the lowest castes, the suppressed and exloited in the centre of society. Liberalization of Indian economy began with the the Inauguration of Pamulaparti Venkata Narasimha Raoas Prime Minister on the day of the summer solstice of 21 June 1991. 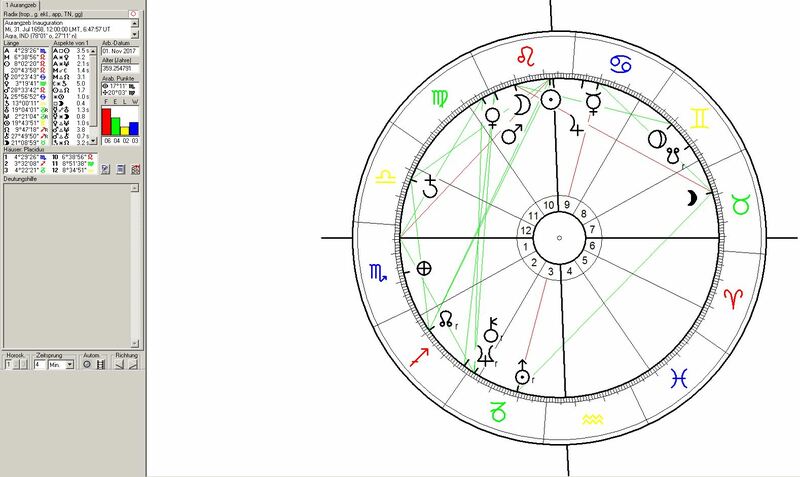 Really remarkable was the extremely auspiscious and highly dynamical fruitfulness conjunction of Mars, Venus and Jupiter in the center of magnetic fire sign Leo the sign of self-centeredness, birth, sexuality, fruits, royalty, heat, The conjunction resonated exactly with the highly problematic Saturn-Pluto-Venus-Sun conjunction from the Indian Independence chart. Saturn the sign ruler of Uranus, Neptun and the North Node Rahu in Capricorn was the only one of the 12 sytemical astrological planets in direct aspect to the astrogeographical coordinates on Delhi. Saturn`s position at 5°53` in Aquarius the sign of the sky. innovation, solutions, self-help and reconnection with the fuller potentials of the country and people fell in a close square to the 3°Taurus constellation of the central govenment in Delhi. 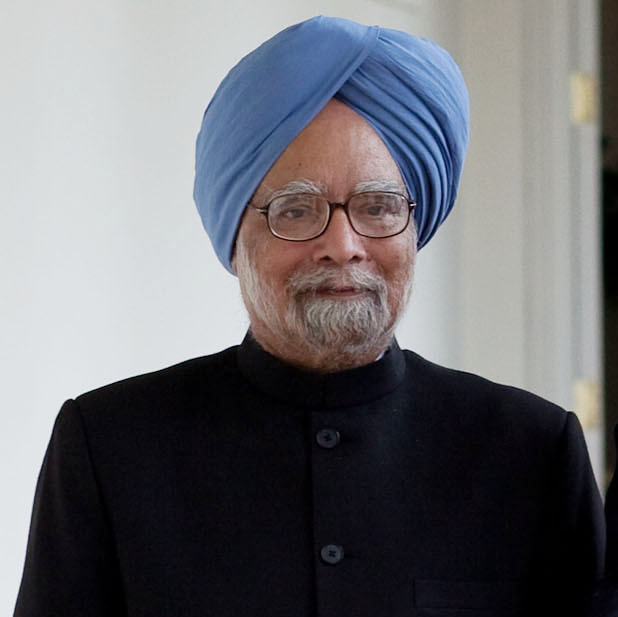 Saturn in Aquarius challenged Taurus – the status of an agriculture orientated economy through the economic liberalisation program together with Manmohan Singh as Finance Minister. Saturn the planet of effectivity, control and rules in Aquarius the sign of anti-centralism and deregulation turned out as a highly progressive abut still contollable approach to the reforms. The Indian economy has been growing extremely fast since the introduction of these changes. The following chart for the coronation of Qutb al-Din Aibak calculated for 26 June 1206 (jul.) at noon and for Delhi can be used for this period in Indian history. 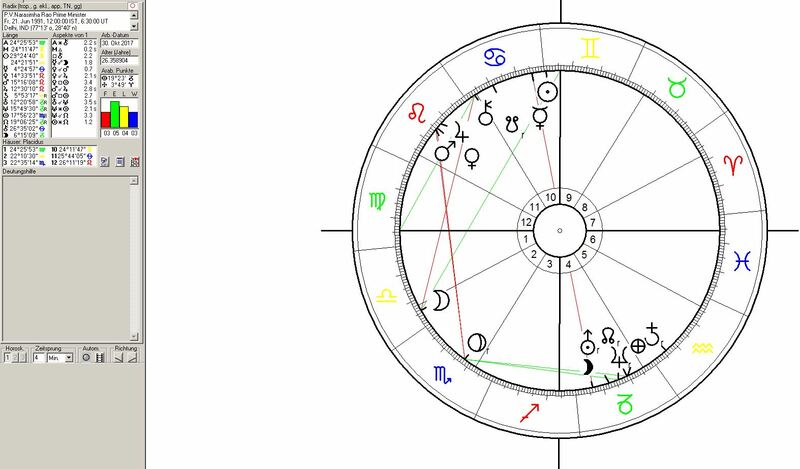 The astrogeographical coordinates for Lahore where the coronation was carried out are: 23°Aquarius and 21°Cancer. 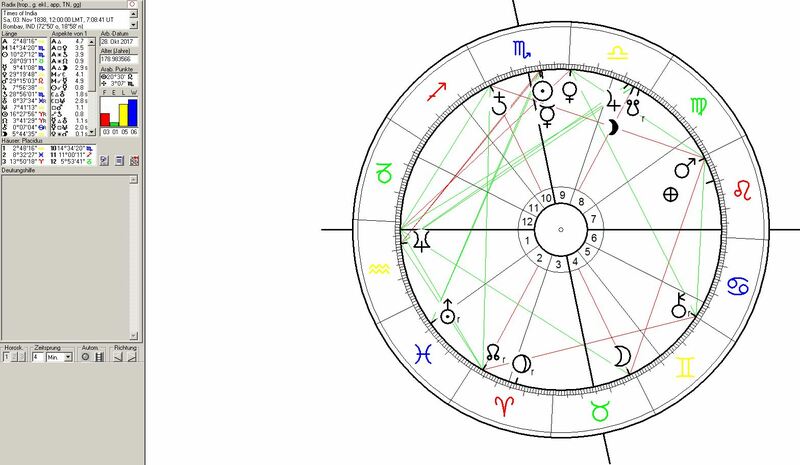 The position of Uranus the planet of innovations at 19°Leo during the coronation shows the resonance between the innovations brought by the Delhi Sultanate and the problematic Saturn-Pluto-Venus conjunction between 13° and 15°Leo from the 1947 chart for the indpendence of India. Venus the planet of wealth and territorial possessions was conjunct the astrogeographical coordinate of Delhi at 26°Leo explaining the territorial control from Delhi, its strength, profits, wealth, stability and even the prominent position of the harems of Delhi in the newly installed political system. The Mars-Saturn conjunction – the constellation of the warrior castes and warfare in Gemini the sign of intelligence, information, spying, practical skills, technology and learning appears as an important factor for practical innovations in the armies and warfare technologies of the Delhi Decanate. This constellation is located between 3° and 5°Gemini and in resonance with the astrogeographical position of Agra on 6°Gemini and 5°Virgo pointing at Agra as the site of the devlopment of military technology and its later role as the capital of the later “Gunpowder Empire in India” (Mughal Empire). The First Battle of Panipat on 21 April 1526 fought between the forces of Babur invading from Kabul (20°Taurus-12°Sagittarius) and the Lodi Empire that ruled over Delhi marked the beginning of the Mughal Empire in India. 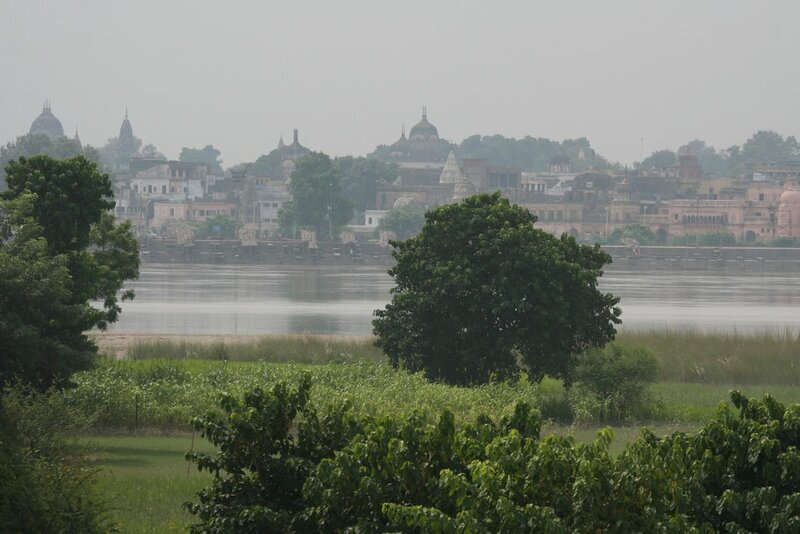 This was one of the earliest battles involving gunpowder, firearms and field artillery in India. The superiority of the Mughal Empire in regard to the use of modern arms of that time in India is a reason why the Mughal Empire is coznted as one of the “Gunpowder Empires”. Astrogeographically the Battle of Panipat is to be understood through the Mars-Jupiter conjunction – a constellation of luck in warfare between 21° and 25°Taurus the sign of occupation and possession of territory and wealth that was approaching the exact square to the 26°Leo astrogeographical coordinate of Delhi in the dorm of the invading armies of Babur in a classical constellation of defeat for the defenders of Delhi. Though the Moon was transiting over the resonating degrees of the Delhi armies on the last degrees of Leo in the morning of that day its ingress into Virgo the sign of hospitals, nurses and doctors in the afternoon brought the defeat of Delhi. Akbar the Great reigned from 1556 to 1605 as the third Mughal emperor. The Uranus transit square to the astrogeographical position of Delhi during his coronation marked his reign as a period of innovations and fundamental changes. Although Akbar resided in Agra not in Delhi I will investigate his reign in relation to Delhi for the purpose of astrogeographical comparison of the continuity from the Delhi Sultanate to modern India. The position of Uranus the planet of innovations, inventions, inspiration, abstraction, holistic perspectives, liberation and reconnection with the fuller potentials of the people and the country at 1°Scorpio the sign of metal working, steel procession, cannons, fire arms, bullets, alchemy, chemistry, gunpowder in exact opposition to the 3°Taurus astrogeographical coordinate of Delhi stands for the many technical, social, spiritual and cultural innovations introduced during Akbar`s reign. Akbar`s innovations were by far more than just technical improvements, new and better weapons or gunpowders. One of his holistic Uranian innovations was a syncretic (abstract) approach to religion under the name of Dīn-i Ilāhī (lit. “Religion of God”) that was aimed at merging the best elements of the religions of his empire, and thereby reconcile the differences that divided his subjects. The Dīn-i Ilāhī was introduced in 1582 in the early phase of Uranus` opposition transit to Delhi`s 26°Leo astrogeographic position. 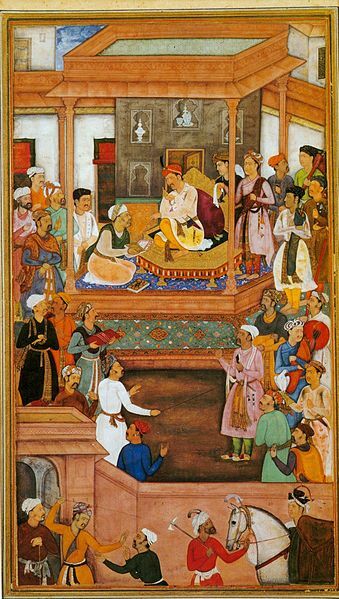 Akbar promoted tolerance of other faiths and repealed the tax on non-Muslims) in 1568. He built the Ibādat Khāna a debating house at Fathepur Sikri that encouraged Hindus, Roman Catholics, Zoroastrians, Jains and even atheists to participate. Religious leaders and philosophers from around his diverse empire were invited to Akbar’s Thursday evening discussions. 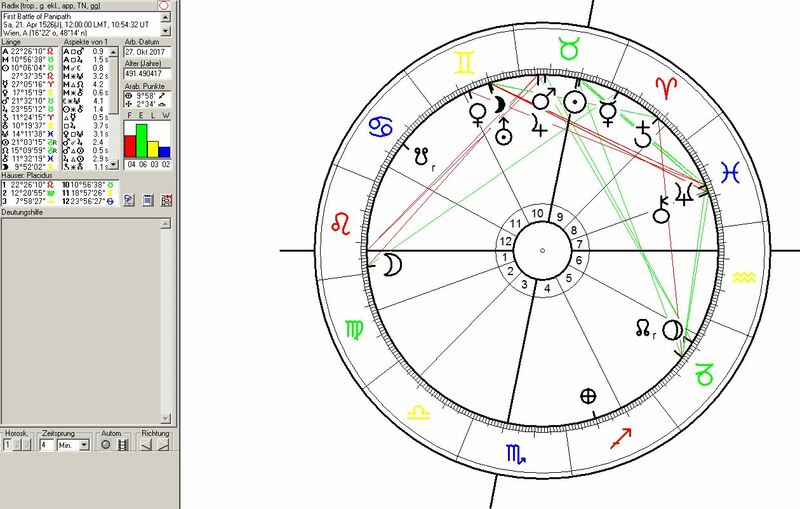 I`m presenting the example of the extinction of Hampi under the effects of Pluto`s dawning transit over the astrogeographical positions of Hampi at 17°Leo and 21°Pisces as an example for Pluto conjunctions in astrogeography. The Battle of Talikota was a watershed battle fought between the Hindu Empire of Vijayanagara and the Muslim Sultanates of the Deccan on 23 January 1565 in northern Karnataka. Aliya Rama Raya the King of Vijaynagar was beheaded during the battle and his capital Hampi looted and burnt for 6 months and wiped out completely. The battle was decided by the treachery of 2 muslim generals that changed sides during the battle to directly attack the Vijaynagar king. The “treachery complex” could astrologically be associated to the Moon position in Scorpio the sign of Pluto`s rulership. During the Battle of Talikota Pluto occupied 14°27`Pisces. Pluto`s exact transit over Hampi became effective two years after the Battle of Talikota between May 1567 (19°Pisces) and February 1573 (23°Pisces). The fact that there were no planetary aspects to Delhi except the Moon at 0°Scorpio the sign of treachery is an indication that the Mughal Empire in Delhi wasn`t directly involved in that war. 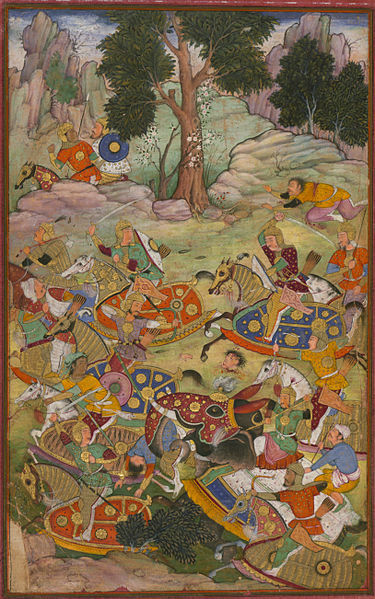 The fact that the fast moving Moon was transiting in opposition to the 3°Taurus position of Delhi in the afternoon of the battle may indicate that the strength gained by the Deccan Sultanates through their victory included a minor threat to the position of the Mughal Empire. 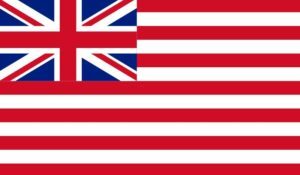 The foundation of the British East India Company started the british invasion of South-East Asia in the year 1600 during simultaneous transits of Uranus conjunct the 3°Taurus position of Delhi and Neptune conjunct Delhi`s 26° Leo position. By 1858 and 257 years later under Uranus 3rd return to the same position over Delhi and in Taurus the british rule (British Raj) over India was complete. 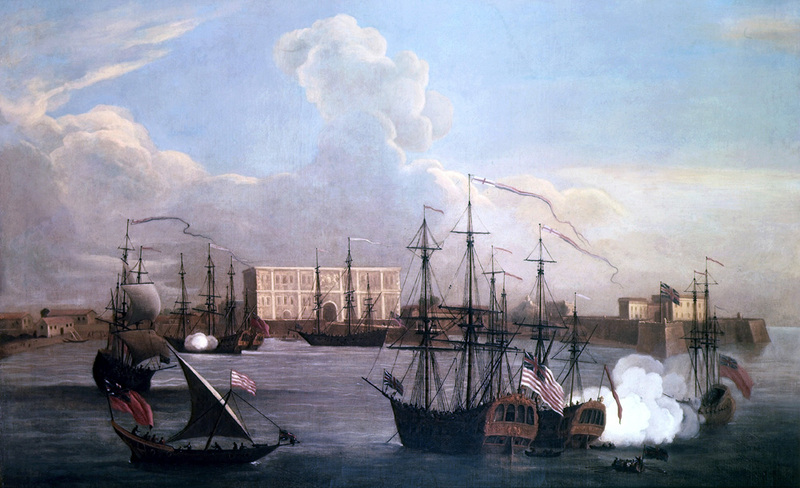 The British East India Company was founded through a Royal Charter from Queen Elizabeth I that granted it the monopoly for all trades east of Cape of Good Hope on 31 December 1600. The foundation was a major step in the conquering of Asia through globalized hypercapitalism. The foundation of the BEIC was accompanied by intense transits of the outer planets in relation to the astrogeographical positions of London, Delhi and Rangoon. 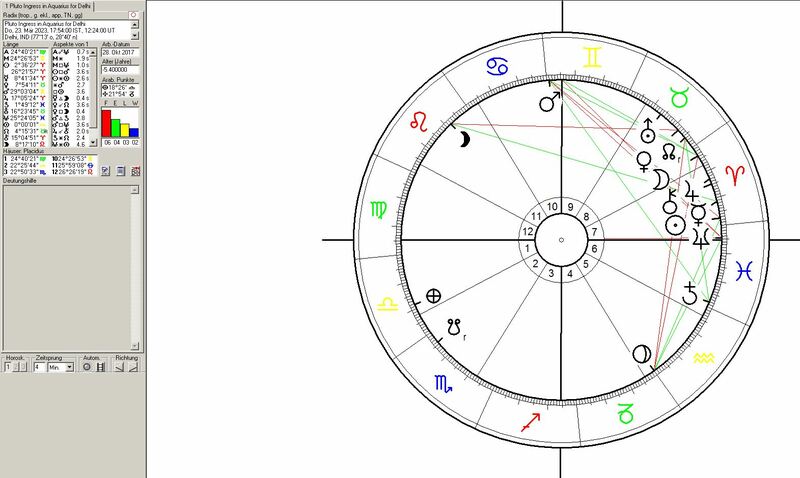 Mars the planet of warfare at 27°Capricorn was conjunct the 28°Capricorn astrogeographical position of London. As the sign ruler of Pluto in Aries Mars` transit reflected a climax of the period of Pluto`s transit in opposition to the 24°Libra coordinate of London between 1600 and 1604. Pluto` s fascination as the ruler of Scorpio the indicator for the robber castes and foreign territory seems to have drawn the attention away from the British homeland. The astrogeographical positions of Yangon (Rangoon) the former capital of Myanmar at 12°Aries and 17° Aquarius were aspected by conjunction through Venus the planet of territorial possessions, capitalism and wealth at 16°Aquarius and opposition through Chiron the indicator for strategical planning, careful action, optimal use of ressources and slavery from 18°Leo. For Delhi the foundation of the British East India Company came during a period of simultaneous transits of Uranus over the 3°Taurus astrogeographic position of Delhi (1599-1602) and Neptune over the 26°Leo coordinate (1588-1601). Uranus in Taurus stood for the social changes, globalized capitalism, european political ideas, new technologies of food production and exploitation of natural ressources and the foreign control over indian economy installed by the invaders. Neptune`s transit over the royal degrees resonance of Delhi in Leo stood for the state of paralysis, deception, corruption, suppression of development and holistic religion, spiritual manipulation, insecurity and weakness in the Mughal Empire at the time of the arrival of the British. The Neptune conjunction here suggests that the conquering modus of the Mughal Empire had run dry. For the effects of Neptune conjunctions with capitals compare the Neptune transit over Berlin between October 1940 and August 1944 and the Saturn-Neptune conjunction over London during the Great London Smog of 1952. Mercury the planet of negotiations, intrigues, lies, stealing, cleverness, spying, technology and practical intelligence at 7°Aquarius had just passed the square position to Delhi`s 3°Taurus coordinate in the days of preparation before the official contract that granted the monopoly to the British East India Company became effective. Aurangzeb was the sixth, and widely considered the last effective Mughal emperor and successful expansionist. During his reign, the Mughal Empire reached its greatest extent, ruling over nearly all of the Indian subcontinent. During the inthronisation of Aurangzeb Mars at 28° Leo was conjunct the astrogeographic position of Delhi indicating that strongest centralism, the absolutism of his personal status, warfare and military expansion were the major topics of this Mughal Emperor`s reign for the heart and center of the union of India in Delhi. Aurangzeb`s death was the end of the expansion and the beginning of the decline of the Mughal Empire. 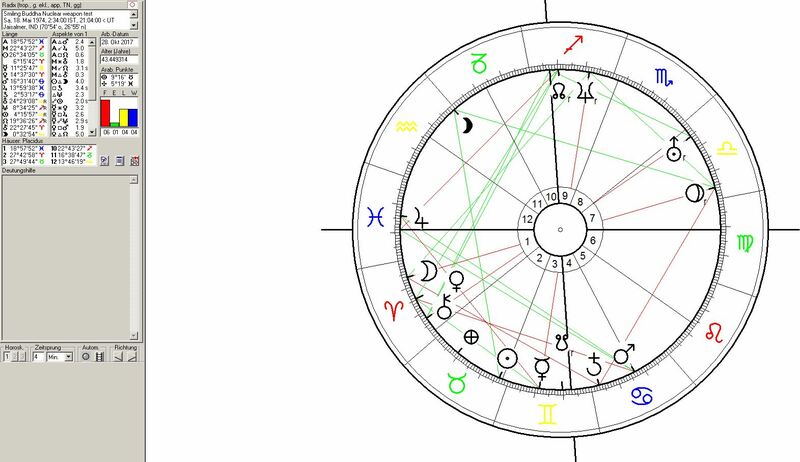 It occurred shortly before Pluto`s transit conjunct the 26°Leo coordinate of Delhi. This is another example of the astrogeographical resonance of Pluto`s transits with the death of the ruling personality as in the case of the Siege of Delhi under a Pluto conjunction, the killing of Indira Gandhi under a Pluto opposition and the destruction of Hampi under a Pluto conjunction. 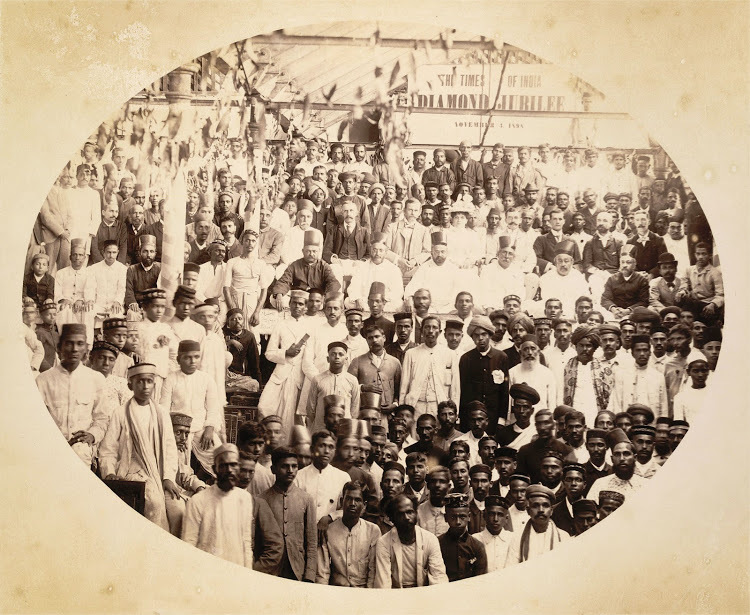 Clerks, compositors and castors in The Times of India office in Bombay, Taken on the occasion of the newspaper’s Diamond Jubilee (60 years), November 1898. The English Education Act was a legislative Act of the Council of India in 1835 that promoted English as the administrational language in India through the decision to support English education in the country. Though I couldn`t find out the exact date for the English Education Act I`m presenting this example for the precision of interpretation of astrogeographical transits of the outer planets here because of the rarity of this data and historical events. The English Education Act was without doubt an act of aggression, manipulation and infiltration of indian culture, society and political development. 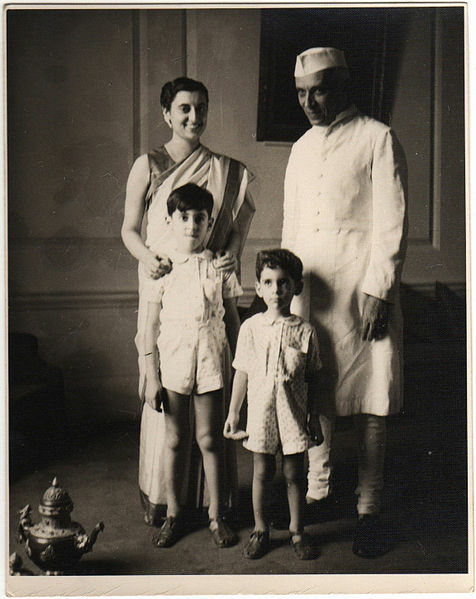 But its long-term effects prepared India for the democratic constitution of the Indian Republic in 1950 – a unique step for Asia and many countries worldwide until today. The example of China which is still unable to install a democratic political system in the 3rd millenium could serve for consideration of the progressive effects of the English Education Act. The introduction of the English Education Act came during the square transit of Neptune at 3°Aquarius to the 3°Taurus astrogeographical position of Delhi and the opposition transit of Uranus at 26°Aquarius to the 26°Leo coordinate of Delhi. The square position of Neptune stood for the paralysis, corruption and weakness of Indian armies and the inability to defend their own territories (Taurus aspect). 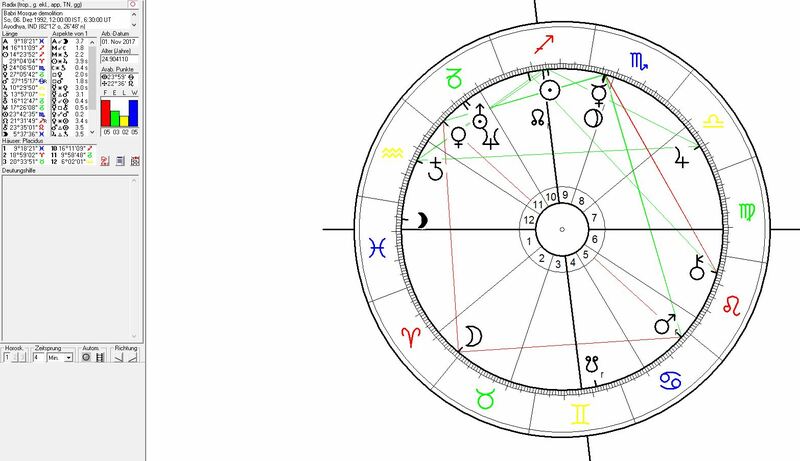 The opposition of Uranus the planet of revolution, liberation, innovation, self-finding and reconnection stood for the need for reforms and changes in order to stimulate developement. The influence of creative, innovative, holistic air sign Aquarius the sign of the sky, heaven, self-finding, saddhus, emancipation, abstraction, the dalit and slave castes and of reconnection with the fuller potentials stood for the developments that connected India with the more globalized european modernity, capitalism and industrial revolution during these transits. The foundation of the Times of India was a propagandistic and educational measure that followed the English Education Act in 1838 . 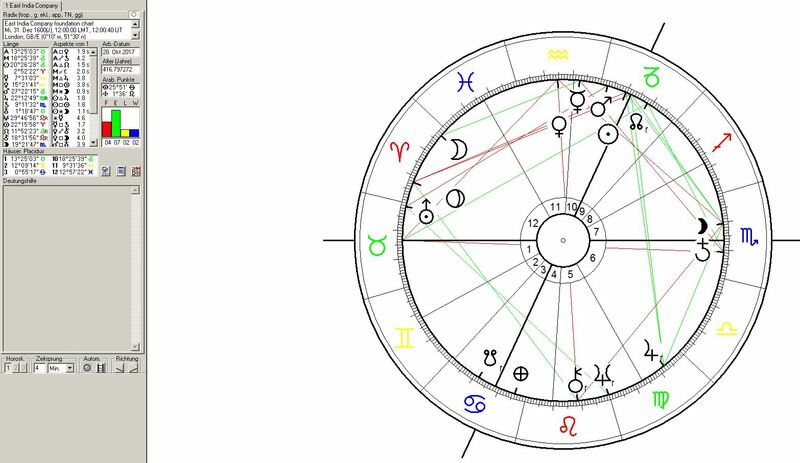 Astrological chart for the foundation of the Times of India on 3 November 1838 clasulated for 12:00 noon. 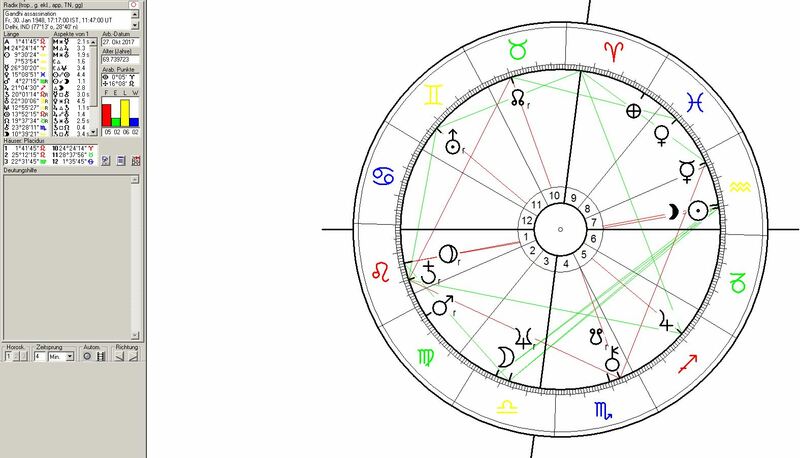 The establishment of the “Times of India” was put into practice again with strongest transits in resonance with the astrogeographic position of Delhi: a Moon – Saturn opposition square to Mars over Delhi! Saturn the planet of control, rules and regulations at 28° in Scorpio the sign of hierarchical structures, dominance, establishment of dogma, propaganda, visualization, sculpting, photography, copies and printing was in exact square to Delhi`s 26°Leo coordinate. The Moon on the last degrees of Taurus the sign of wealth, territorial possessions and as the sign of agriculture and 12th house from Gemini an indicator for the limitation of knowledge and information passed the square position to Delhi in an aspect of highest profitability. Mars on 29°Leo was transiting the royal degrees conjunct the astrogeographical coordinate of Delhi. indicating that the Times of India would turn out as a long-term effective support of the defense system of central governments, centralism in India and the stability of the Union. In early May 1857 the British informed the 82 year old emperor Bahadur Shah II that the Mughal Reign would end with his death. This led to the participation of Bahabadur in the Delhi Uprising of 11 May 1857. 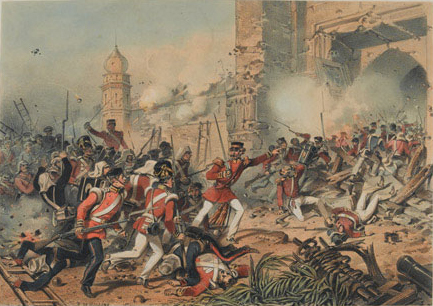 The Siege of Delhi between 8 June – 21 September 1857 was one of the decisive conflicts of the Indian rebellion of 1857. 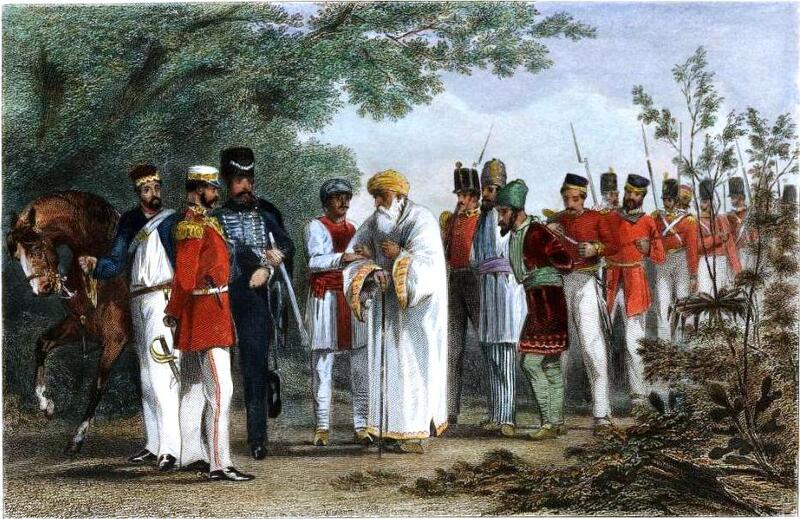 Following the capture of Delhi by indian rebel forces on 11 May 1857 the British and their allies reconquered Delhi on 21 September. Astrogeographically the british victory over Delhi involved two transits of slow-moving planets in strongest resonance to the 3°Taurus coordinate of Delhi. Pluto the planet of transformation and the death of structural impediments of development at 6° in Taurus the sign of wealth, food production, agriculture and control over territory had been transiting in conjunction to Delhi for nearly 3 years. 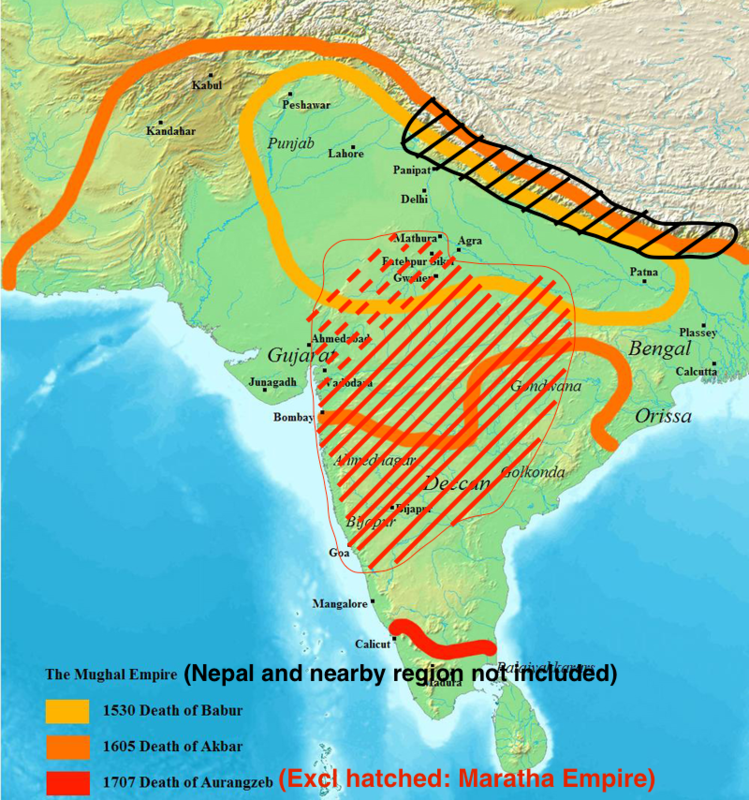 The period of Pluto`s transit conjunct Delhi between 1853 and 1859 brought the death blow to the Mughal Empire. and Chiron at 6°Aquarius in a square. Pluto stood for the transformation of belief systems, role conduct and dogma in Indian society, the enforcement of the defense and walls of Delhi and the traumatic issues through the foreign control over the Mughal capital. As the planet of strategical planning, careful action and optimal use of ressources Chiron`s square can be understood to represent the strategical and economical pressure exerted onto Delhi by the globalized british hypercapitalism in the form of the British East India Company. 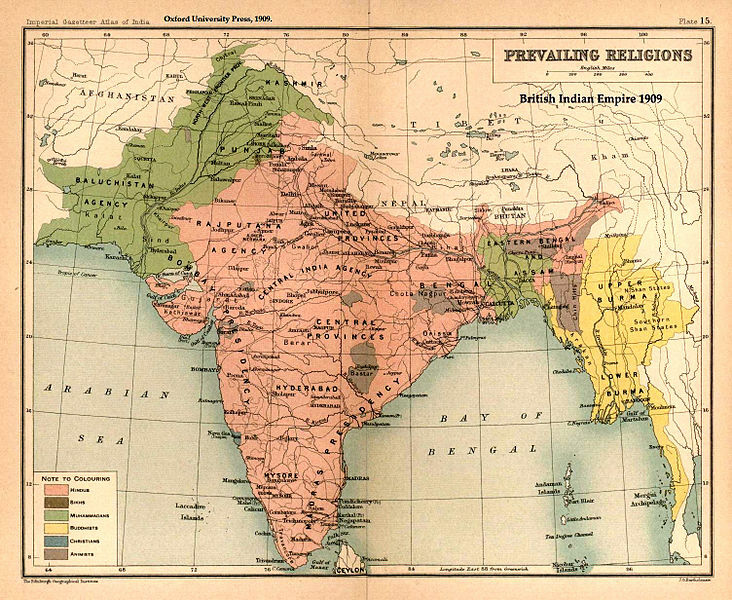 The Indian Rebellion of 1857 occured during the transit (1855-57) of Uranus the planet of rebellion and revolution, self-finding and reconnection with the fullest potentials in the last degrees of earth sign Taurus the sign of profits, wealth, global capitalism and conquering territory over the square position to Delhi`s astrogeographical ccoordinate at 26°Leo. Uranus` square from the highly profitable last degrees of Taurus indicates the motif of “liberation” through an attack of globalized capitalism. And another really strong astrogeographical transit whose presence ist really impressive for any astrological consideration here: The Siege of Delhi ended under the heavy fire of British artillery when fast moving Mars the planet of warfare had reached the royal degree of 25°Leo exactly conjunct Delhi. Mars is of course no significator here for the structural problems that led to the end of the Mughal Empire. But the transit is impressive for the moment of the conquering of the city, the arrival of troops and the killing of the heirs to the throne. The Moon moved through the first degrees of Scorpio from early in the morning of the day triggering the square to Delhi`s 3°Taurus astrogeographical coordinate. The Moon square stood for the consolidation of the situation for the attacking side and for the deprivation of power of the rulers of Delhi. 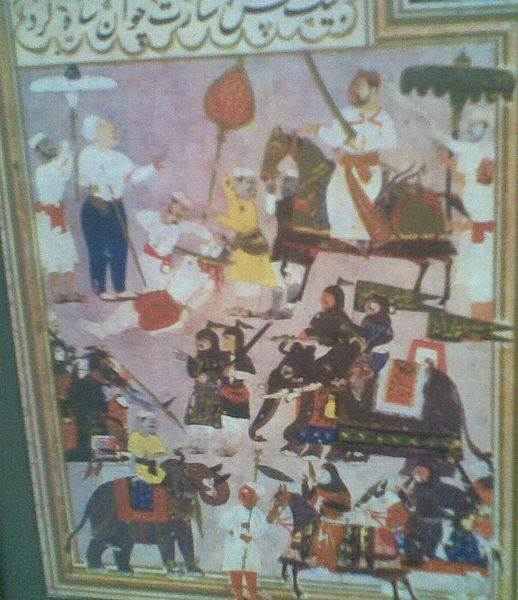 The killing of the heirs to the Mughal throne and the deportation of Bahadur Shah II to Burma during Pluto`s transit over Delhi was the death blow to the Mughal Empire. 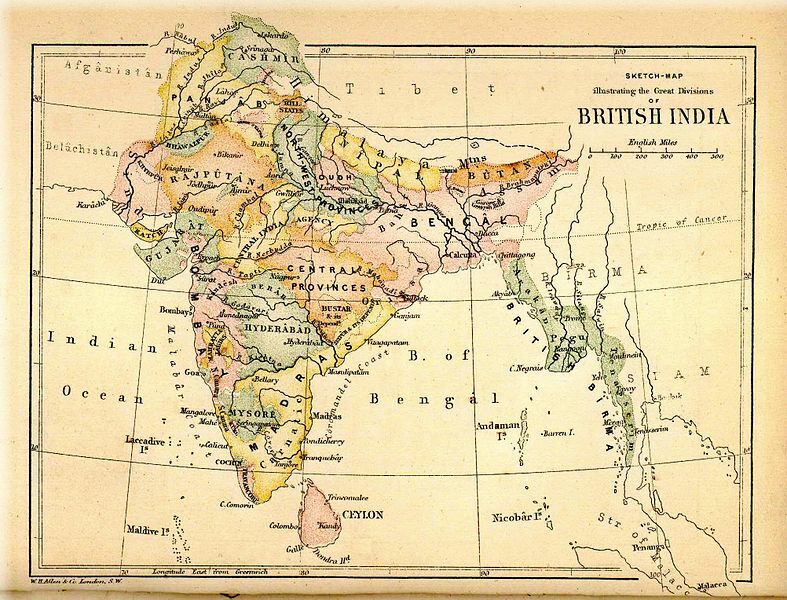 After getting rid of the last Mughal Emperor the British Colonialists finally established the rule of the British Crown over India through the Government of India Act passed by the Parliament of the United Kingdom on August 2, 1858. 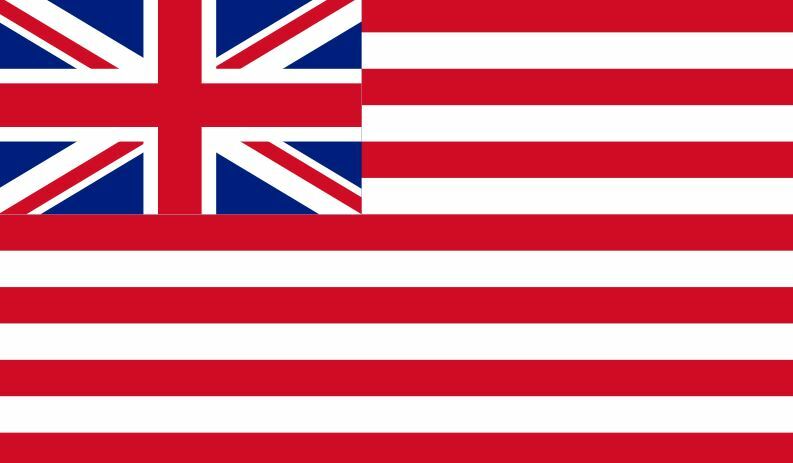 It liquidated the British East India Company and transfered its functions to the British Crown establishing the British Raj. It was effective until the Indian Independence Act of 1947. The Government of India Act was passed during square transits of Saturn the planet of stability and control and indicator for the official government over 3°Leo in exact square to Delhi`s 3° Taurus coordinate and from Mars at 25°Scorpio the sign of the robber castes in exact square to the 26°Leo coordinate of Delhi. The transit of the Moon over Pluto`s position at 7°Taurus the sign of economical profits and possession of land enforced the effects of Pluto`s transit over Delhi between 1853 and 1859 that brought the death blow to the Mughal Empire in Delhi. Indira Gandhi, the 3rd Prime Minister of India, was assassinated on 31 October 1984 at 9:20 a.m. at her Safdarjung Road, New Delhi residence. She was killed by two of her bodyguards, Satwant Singh and Beant Singh, in the aftermath of Operation Blue Star, the Indian Army’s June 1984 assault on the Golden Temple in Amritsar which left the Sikh temple heavily damaged. 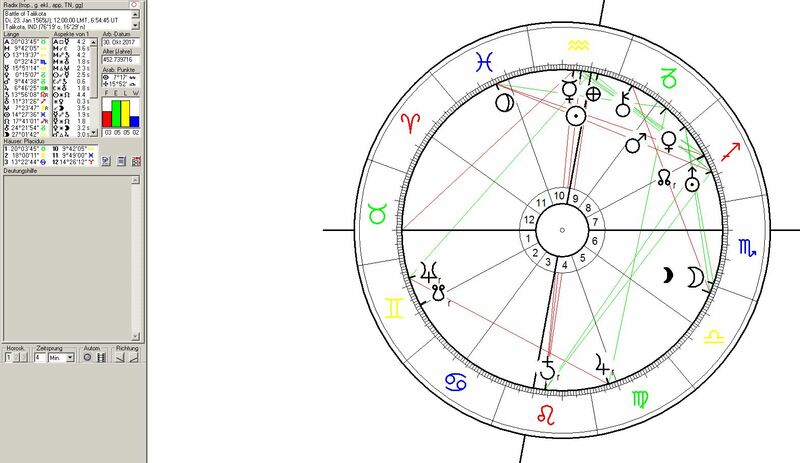 The assassination of Indira Gandhi fell into the period of the transit of Pluto over 3° in his own sign Scorpio in exact opposition to the 3°Taurus astrogeographical position of Delhi between November 1983 and October 1986). The murder of Indira Gandhi occured 141 years after the Pluto transit over Delhi`s 3° Taurus coordinate which had marked the death blow to the Mughal Empire in 1857. 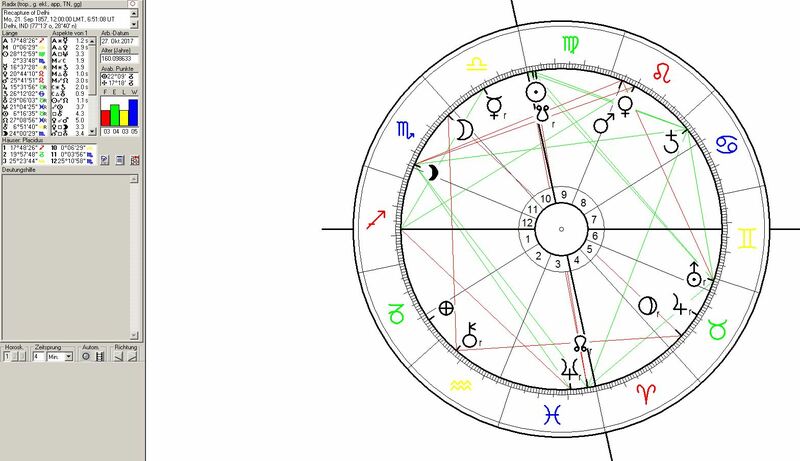 This Pluto transit marked the death blow to the era of the Nehru Dynasty in India although the assassination of Rajiv Gandhi 7 years later and with Pluto at 18°Scorpio was still to come. The return of the axis of the North and South Nodes Rahu and Ketu from the assassination of Mahatma Gandhi between 27°Taurus and 27°Scorpio in a square to Delhi`s 26°Leo astrogeographical position explained the aim of the conspiracy behind the Sikh assassinator as an attack on the central government and union of India. The same accounts for the exact square of the fast moving Moon the indicator for personal emotionality from 3°Aquarius the sign of rebellion and self finding to the 3°Taurus position of Delhi. India`s first Nuclear Weapon Test was carried out under the name of Smiling Buddha on 18 May 1974 at 02:34 a.m. at the Pokhram I testing site in Rajasthan. I`m showing the chart for the first nuclear weapon`s test as another illustrative detail for a particular astrogeographical resonance topic. The astrogeographical transits of the day showed no support of the strength of the position of the central government in Delhi. The only exact transit of the 12 sytemical astrological factors was the position of the Sun indicator for electric power at 28° Taurus in exact square to the 26°Leo coordinate of Delhi. As the ruler of Leo and thus of the astrogeographical coordinate of Delhi in Leo this sun position can be understood as an outsourced representative of the sphere of interests of the capital Delhi. The demolition of the 16th-century Babri Mosque in Ayodhya on the supposed birth site of the Hindu god Sri Ram on 6 December 1992 by by Hindu fanatics ocurred under a Mercury-Pluto conjunction a constellation of conspiracies and propagandistic manipulation at 24°Scorpio in a square to the 26°Leo coordinate of the central government in Delhi. Babri Mosque had been built by Babur the founder of the Mughal Empire in 1528 shortly after his invasion in North India in an act of demonstration of his personal dominance over hinduism. The astrogeographic coordinates of the City of Ayodhya are located in the intensely idealistic constellation of 17°Aquarius the sign if the sky and 23° Libra the sign of angels (FL1). The effects of the demolition of Babri Mosque were catastrophic as it led to violent clashes between Hindus and Muslims with thousands of people being killed. The demolition of Babri Mosque came very late in history. This in itself is a definite proof of the oreinataiuon o deep spirituality and relative peacefulness of the Hindu religion especially compared to the by far more violent monotheism of the Muslim religion. The extremely violent reactions onto the incident in Pakistan gives a clue about this dramatical problem when violence takes over religion in order to suppress and dominate spirituality itself. But what the Mercury-Pluto conjunction really reveals here is that the demolition of Babri Mosque was politically organized to promote the cause and profits of the lobbyists behind Hindu nationalism and the radical Hindu parties. 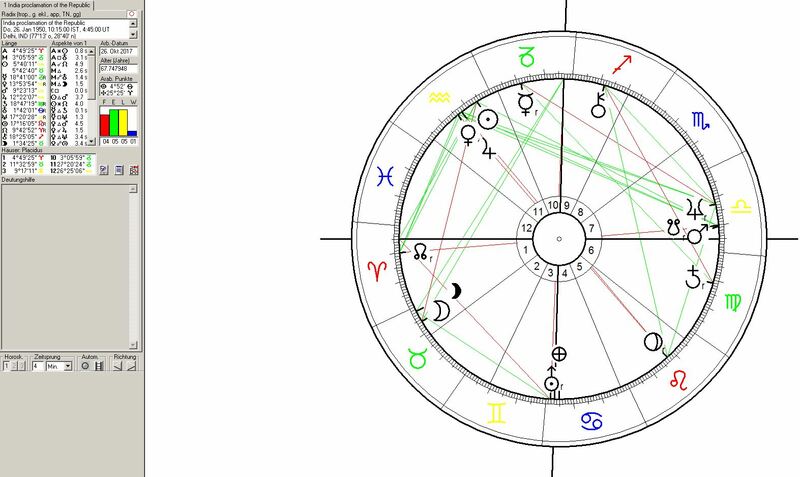 The square from the Mercury-Pluto is a clearest indication that the incident was organized as a straight attack on the central government in Delhi. The same can be seen from the transit of Chiron the planet of strategical planning and optimal use of ressources conjunct the 26°Leo astrogeographic position of Delhi: the demolition of Babri Mosque was organized as part of the electional campaigns of BJP and its allies. The propagandistic measures taken by the government of Pakistan to protest the demolition of Babri Masjid by closing offices and schools on 7 December are to be understood as symptomatic of the square from the Mercury-Pluto conjunction to the Central Government of India in the same way.